Here are some details I've gleaned about the Moorish uprising led by the commander known variously as Al Azraq, Al Zaraq, or El Drach. Azraq was born in the village of Alcalá de la Jovada, sometime between 1210 and 1215. His full name appears to have been: Abu Abd'Allah Mohammed ibn Huydhal or, if you prefer, Habuadele Yuan Fudayl, give or take a few syllables. From his father, Huydhal, Al Azraq inherited control of a vast spread of our mountain territory, covering the Val de Gallinera and the Val de Pop as well as the valleys of Alcalá and Ebo. It appears to have been a well-ordered and prosperous domain, with a good system of irrigation laid on and some progressive endeavours being undertaken in stock raising and land management. It was also strategically vital, with some 16 to 18 forts and castles controlling the key passages in the Moorish taifa of Denia, connecting the coast to the inland towns of Xátiva, Cocentaina and Alcoi. 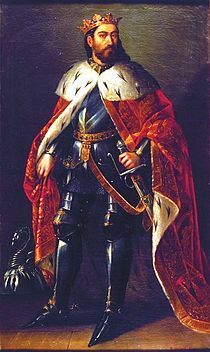 King Jaume I "The Conqueror"
This strategic significance was not lost on the king of Aragón, Jaime I (Jaime, Jaume, Jacme, or Jacobus), el Conquistador; born in 1208 and reigning from 1217 to 1276. The commercial and maritime wealth of Catalonia was already incorporated into his kingdom. Southward expansion in the form of a Crusade against the Moorish infidels was the clear path ahead for Jaime. He took the Balearics between 1232-1235 and the city of Valencia in 1238, a conquest we still celebrate as the fiesta del Pais Valenciano on October 9 each year. Denia was next on Jaime's list. He hoped to minimise the bloodshed -- and, not incidentally, simplify his own campaign -- by pacifying Al Azraq's pivotal territory through treaty rather than attack. He dispatched his eldest son, Don Alfonso (heir apparent to the Aragon throne), as ambassador to the Moorish wazir. (This Alfonso is not to be confused with his contemporary and cousin, the crown prince Alfonso of Castille, who will make a cameo appearance later on in our story). If it was a warlike era, it was also a courtly and cultured one. The Aragonese prince was received with all due honours at the castle Ben i' Zelim, known to us as Benisili. Records, of course, are sparse and sketchy, but it appears that the two antagonists respected and even liked each other. From Benisili they repaired to Al Azraq's palace in Alcalá de la Jovada, where they signed a treaty known in Valencian history as the Pacto de la Jovada, or, alternatively, the Pacto del Pouet (‘Pact of the Well’). The well where it was signed is not the town fountain, where today the water spurts from the mouth of a replica of Al Azraq. It is a little distance outside the village. 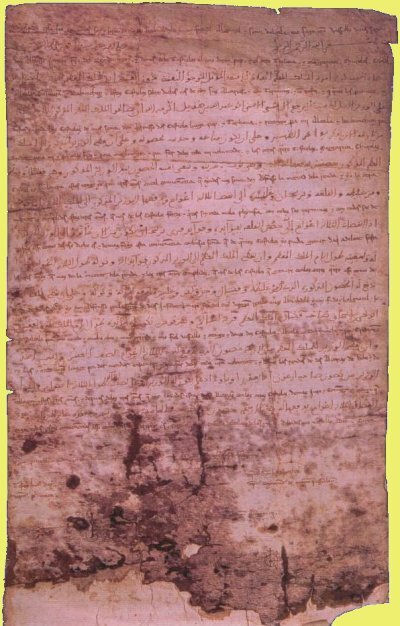 The treaty was written in both Romance, (an early version of Castillian), and in Arabic. It is highly significant in linguistic history, being, I believe, one of only two interlinear translations of Arabic and Romance surviving from that epoch. The differences continue, more than a question of flowery Islamic pieties. Most notably, the word ‘vassal’ never appears in the Arabic text, which says simply, “... to make a treaty for three years.” Even the dates do not agree; the Castillian text being dated 16 d'abril, 1244, and the Arabic one 15 d'abril, 1245. Scholars have all sorts of theories about that anomaly, the simplest being the existence of varied and inconsistent calendars during the Middle Ages. On the question of who knew what about the differing texts, I have one purely personal, subjective hunch of my own. If anyone was sufficiently multilingual to understand every word of both texts, my money is on Al Azraq. The odds of his being fluent in Castillian strike me as considerably higher than the odds of Don Alfonso's being fluent in Arabic. But that’s just a guess. The two texts do agree in naming eight of Al Azraq's major castles to be handed over to the prince of Aragón. 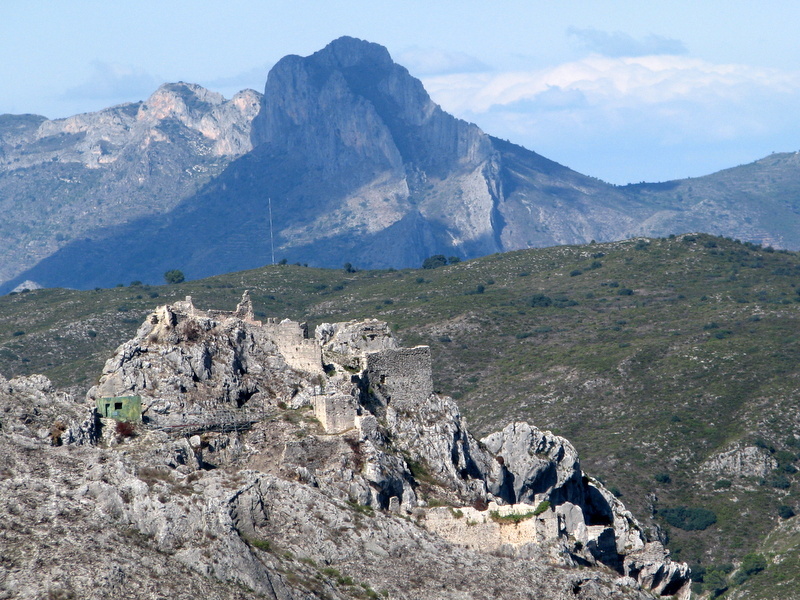 Castillo de Pop, on Caballo Verde, perhaps above Benichembla, or perhaps near present-day Fontilles or Murla. The treaty further specifies how the profits and rents from the castles and their properties were to be shared between Azraq and Don Alfonso, and adds that any further castles which Azraq will take in Alfonso's name during the following three years will have their profits similarly divided. This entire arrangement is consistent with Jaime I's style of conquest. Where possible, Jaime made vassals of the Moorish landlords, and encouraged their people to stay on and continue working the land. ​How and where Azraq's rebellion began is tricky to reconstruct. Since the professional historians despair over getting the chronology of the events sorted out, I won't apologise for my own confusion. One colourful (but possibly apocryphal) story, with no dates attached to it, relates that the Queen of Aragón, Dona Violante, had been trying to persuade Al Azraq to adopt the Christian faith and take to wife a Christian noblewoman, daughter of Pedro Ximen Encarroz. After some reflection, Al Azraq announced his intention to do that very thing, and sent a wedding invitation to Jaime I and Doña Violante. The royal couple travelled east from Xátiva, where they were staying at the time, only to encounter a ferocious ambush at Rugat, from which they were lucky to escape with their lives. That event (if in fact it happened) would certainly seem to signal the beginning of hostilities. Whatever could have prompted Al Azraq to such treachery? There is no question that he raised arms against Aragón. The battles seem to have begun in 1248, three (or is it four?) years after the signing of the Pacto del Pouet. If, as the Arabic version suggests, it was simply a three-year truce treaty, why should Al Azraq not take up arms when the truce expired? His position was one of considerable strength. The Muslim refugees from Valencia and Denia added substantially to his manpower, and may well have urged him on to resist the advancing Christians. His mountainous terrain would pose diabolical problems to any attacking forces. He was a respected and popular leader defending his home ground. Then, too, the Christian forces were not united. Al Azraq was fully aware of the ambiguous situation of Alfonso of Aragón, who had been made legitimate only by a special papal dispensation after the annulment of his parents' marriage. And that other Alfonso, the newly crowned King of Castille, was not unfriendly towards Al Azraq. At a meeting in Alicante, the Castillian monarch casually asked the Moor if he knew how to hunt. "If it please you," Al Azraq is supposed to have replied, "I'll hunt the castles of the King of Aragón." Evidently the King of Castille was not entirely displeased to know that his father-in-law was meeting a spot of bother in his newly acquired territories. At some point (presumably after the legendary wedding ambush), King Jaime was on a hunting trip of his own -- the traditional kind -- when he received word that Al Azraq had taken the castle at Penáguila. This news that made him pace the floor all night, and travel to be present in person at Cocentaina shortly thereafter. 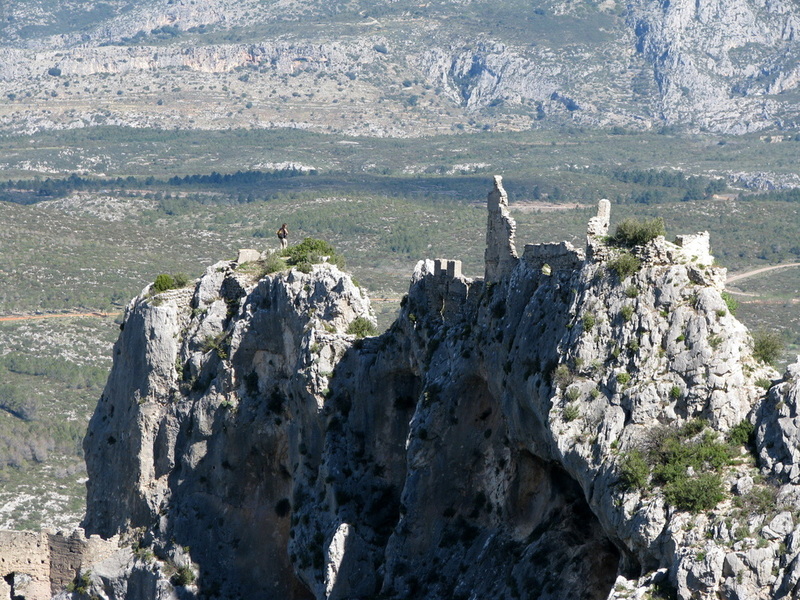 From Cocentaina's castle the King directed his troops' campaigns to quash the insurrection. There was a fierce battle at Peña Caidell (the mountain of Benicadell), and one of Al Azraq's most prized generals lost his life. The Moorish troops retreated to their central headquarters in the Val de Alcalá. Jaime I travelled there in person to accept Al Azraq's surrender, pointing out to the Moor that his situation had become quite untenable, with money and provisions running out. In 1258 Al Azraq conceded defeat and accepted exile. Jaime I, with his characteristic magnanimity, granted two castles, Altea and Polop, to Al Azraq's brother and nephew. But entries in the King's chronicles reveal a lasting bitterness towards Al Azraq himself. Jaime refers to him as 'our traitor, Azdrach.' One can hardly blame him. He wrote with a certain understandable smugness to the King of Castille: "We, too, know how to hunt. We just captured sixteen of Azdrach's castles in eight days." 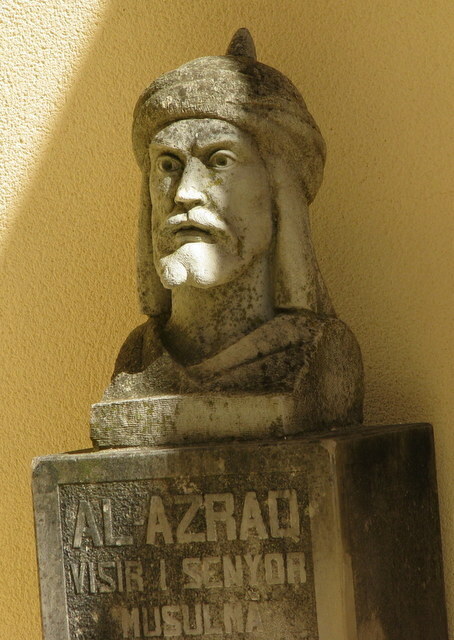 It's assumed that Al Azraq retired to the remaining Muslim kingdom of Granada. Some 17 years later, in 1275, an incursion into Christian Spain was launched by the Almohade king from Marrakech. With the Christian powers in disarray, Al Azraq profited from the opportunity to return to his homeland and rally the local Moorish forces for a fresh insurrection. A siege was mounted against Alcoi. The battle that was fought there is re-created in Alcoi each April on the feast of Saint George, the legendary soldier-saint who, tradition has it, appeared from heaven to inspire the Christian defenders. Abu Abd'Allah Mohammed ibn Huydhal, by now an old warrior in his sixties, fought bravely and furiously for one last chance to reclaim the land of his birth. He was struck in the head by a missile, fell from his horse, and died in the field of battle. The Christian defenders inside Alcoi heard the Muslim troops wailing, 'Wali! Wali!' Just three months later, on July 27th, 1276, King Jaime I of Aragón died in Valencia, not in battle, but of illness. Two worthy opponents made their exit, leaving to another generation the final resolution of their struggle.